Who Needs Grommets and Why? How are Grommets Inserted in the Ear? Most ear infections are either resolved on their own (viral) or are treated with antibiotics (bacterial). Sometimes, repeated ear infections and/or fluid in the middle ear can lead to issues like hearing loss and feeling ‘blocked’, or speech and behaviour problems in children. In cases of recurrent infections, an ear tube (commonly known as grommets) can be inserted by an otolaryngologist (ear, nose, and throat specialist). Grommets are tiny cylinder-shaped ear tubes no bigger than a match head that are placed through the eardrum (tympanic membrane) to allow airflow in the middle ear. They may also be called tympanostomy tubes, myringotomy tubes, ventilation tubes or PE (pressure equalization) tubes. Grommets can be made out of different materials and may have a coating to reduce the possibility of infection. There are two basic types of tubes: short-term and long-term. Short-term tubes are smaller and typically stay in place for six months to a year before falling out on their own. Long-term tubes are larger and have flanges to secure them in place for a longer period of time. Long-term tubes may fall out on their own, but removal by an otolaryngologist may be necessary. Grommets are often recommended when a person experiences repeated middle ear infection (acute otitis media) or has hearing loss caused by persistent middle ear fluid (otitis media with effusion). These conditions are common in children, but can also be present in teens and adults. Otitis media can lead to speech and balance problems, hearing loss, or changes in the structure of the eardrum. Barotrauma (injury to the middle ear caused by reduced air pressure, usually seen with altitude changes as in flying and scuba diving). Each year, more than half a million ear tube surgeries are performed on children, making it the most common childhood surgery performed with anaesthesia. The average age for ear tube insertion is one to three years old. Improve behaviour and sleep problems caused by chronic ear infections. Grommets are inserted through a surgical procedure called a myringotomy. This is an outpatient procedure. 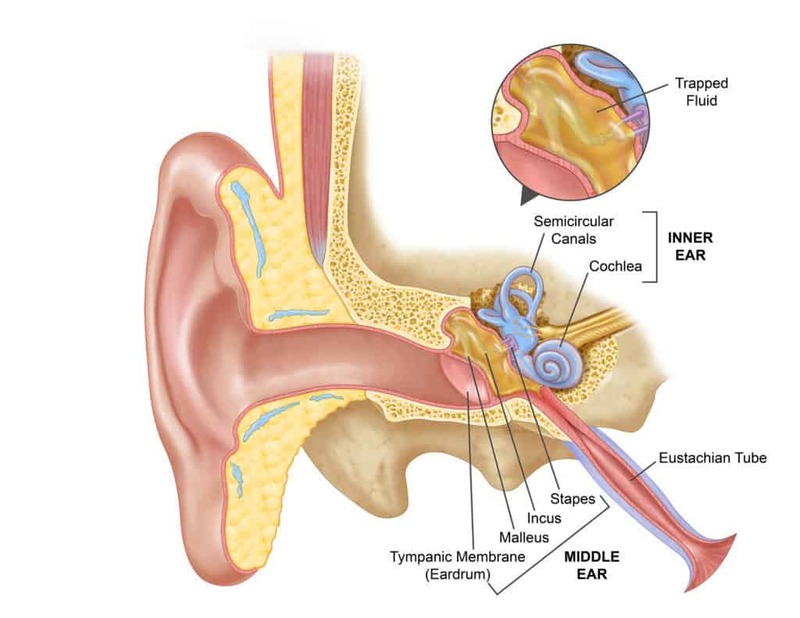 A myringotomy is an incision (a small hole) in the eardrum or tympanic membrane. This is most often done under a surgical microscope with a small scalpel, but can also be done with a laser. If a tube is not inserted, the hole will heal and close within a few days. To prevent this, an ear tube is placed in the hole to keep it open and allow air to reach the middle ear space for ventilation. A general anaesthetic is administered for young children, but some older children and adults may be able to tolerate the procedure without a general anaesthetic. A myringotomy is performed and the fluid behind the eardrum (in the middle ear space) is suctioned out. The ear tube is then placed in the hole. The procedure takes about 20 to 30 minutes, and the patient cannot feel the grommet in their eardrum. Ear drops may be administered afterwards and likely prescribed for a few days. The procedure usually lasts less than 15 minutes and patients wake up quickly. Sometimes, the otolaryngologist will recommend removing the adenoid tissue (lymph tissue in the upper airway behind the nose) when tubes are placed. This is often considered when a second or third tube is needed. Current research shows that removing adenoid tissue at the same time can reduce the risk of infection and the need for repeat surgery. After surgery, the patient is monitored in the recovery room and will usually go home within an hour or two if there are no complications. Patients usually experience little or no pain after surgery, but grogginess, irritability, and/or nausea from the anaesthesia can occur for a short time. If the adenoid has been removed, the patient should stay at home for a short while and resume normal activities slowly. Hearing loss caused by fluid in the middle ear is immediately resolved by surgery. The otolaryngologist will provide postoperative instructions, including when to seek immediate attention and when to set follow-up appointments. They may also prescribe antibiotic ear drops for a few days. If hearing loss is present before the tubes are placed, an audiogram should be performed after surgery. This test will make sure that hearing has improved. Having an anatomic abnormality that inhibits drainage of the middle ear. Visits are required until the grommets fall out (or are removed), which is typically six to 12 months later. Myringotomy with insertion of ear tubes is an extremely common and safe procedure with minimal complications. This can happen when a tube comes out or a long-term tube is removed and the hole in the tympanic membrane (eardrum) does not close. The hole can be patched through a surgical procedure called a myringoplasty. Any irritation of the eardrum (recurrent ear infections), including repeated insertion of grommets, can cause scarring called tympanosclerosis or myringosclerosis. In most cases, this causes no problem with hearing. Ear infections can still occur in the middle ear or around the ear tube. However, these infections are usually less frequent, result in less hearing loss, and are easier to treat—often only with ear drops. Sometimes an oral antibiotic is still needed. If an ear tube expels from the eardrum too soon, fluid may return and repeat surgery may be needed. Ear tubes that remain in too long may result in perforation or may require removal by an otolaryngologist.